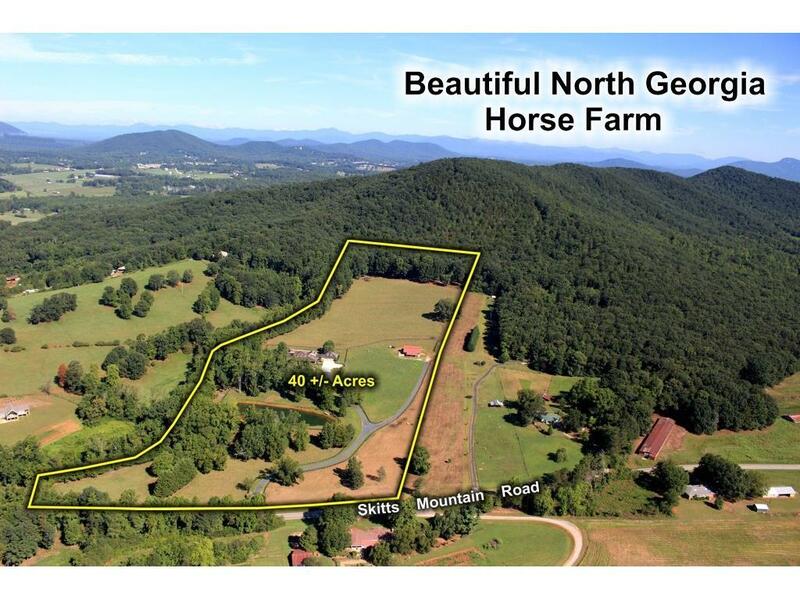 VALLEY SPRINGS FARM- A Gated Equestrian Estate in Prime Horse Country of N. Hall. Appr 40 Acres, Black Board Fencing, 4 Stall Barn w/Tack&Wash Rm & Plumbled for Apt. Well-Fed Pond, Creek, Pastures & Sits at Base of Skitts Mtn. Custom Designed Western Ranch Style Home w/Wrap Around Porches, Pool & Lania 4BR/3BA, Gourmet Kitchen w/ Prof Grade Appl, Grand Keeping Rm w/Massive Stone FP & GORGEOUS VIEWS! GR w/FP, Huge Game Rm above garage. Owners suite w/FP, adj Spa Bath & VIEWS! Hand carved Newell Posts & Solid Cypress Wood Trims, 3-Car Garage- PRICED BELOW APPRAISAL. Directions: Hwy 129 N, Right On Holly Springs Rd (Apprxo 12 Miles From I985) Left On Skitts Mtn Rd, Property On Left.